Original post by guest writer Elizabeth Cox. Updates to the original version of this post have been made to improve accuracy. 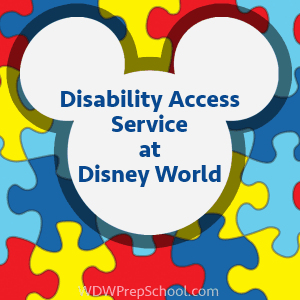 Disability Access Service (DAS) is a system that is in place to assist Disney World guests that may not be able to comfortably wait in a traditional queue environment. The DAS is not a "front of the line" pass, but rather a tool to be used along with FastPass+ in order to provide the maximum amount of flexibility to guests with disabilities. Guests wishing to inquire about DAS can do so at Guest Relations at any of the 4 main parks. Eligibility for a DAS pass is based upon a guest's need, not their diagnosis. Cast Members will not ask for proof of a disability, but will inquire about the type of accommodations you are requesting because of your disability or condition. The person with the disability must be present to obtain the pass and will have their picture taken. It will be added to your My Disney Experience account, and you will be able to access it through the same app you use for FastPass+ and dinner reservations. You will only need to do this process once as it's good across parks for 14 days (60 days for Annual Passholders). It's important to note that you can have family members and others traveling with you on the pass as well (up to 6 people total) but they must be present in person when the pass is obtained. You can add others throughout your stay if they cannot be with you when it's first issued. Once you have your pass, you can send a family member to the ride you'd like to visit and let them know you need a return time using your DAS pass. Any member of your party can obtain the ride pass; the person with a disability does not have to be present. The Cast Member will determine the current standby wait time and usually give you a return time for that attraction based on the current wait, minus 10 or 15 minutes (this is at the CM's discretion and the return times can sometimes vary). For instance, if it's noon and you'd like to ride Space Mountain and the current wait is 50 minutes, they will give you a return pass for 12:40. You can get a snack, visit another ride, or use your regular FastPass+ during the wait time to keep busy. At 12:40, go to Space Mountain and enter through the FastPass+ line. The person with the disability must be with you; you may not use the DAS pass to ride without them. You will need to wait with other riders in the shortened FastPass+ line. Once you are done riding, you may go to other attractions as many times as you wish throughout the day and repeat the procedure. Can I still use FastPass+? Yes! Most families use their DAS pass in between their scheduled FastPass+ times to keep the pace of their trip moving for people that don't wait well. It also helps to combine it with FastPass+ so that you can visit more attractions in less time, for those families that might tire more easily and need a shortened day at the parks. What happened to the old system of going to the front of the line? There was quite a bit of press in the last few years about abuse of the system so Disney consulted with many different advocacy groups to come up with a new system to continue to assist guests with disabilities and reduce abuse. Will I be able to use the DAS pass for character meet & greets or for reserved seating for fireworks? You can definitely use the pass for character meet & greets if they offer a FastPass+ option. However, the DAS pass can not be used for attractions, entertainment and character meet and greets that do not offer both a standby line AND a FastPass+ option. This includes the FastPass+ fireworks and parade viewing locations (since they only offer FastPass+ and no standby line options) and any character meet and greets that do not offer FastPass+. There are limited handicap areas to view the parades that are available on a first come, first served basis for those using wheelchairs or scooters. For those needing a slightly less busy area for fireworks and parades, you might consider using a regular FastPass+ to ensure you have a reserved spot. Who can use the DAS pass? Anyone who has a disability or condition that necessitates waiting outside a traditional line environment may be eligible to use the DAS pass. This includes disabilities that are both seen and unseen. If your family member needs a scooter or wheelchair or has needs that can be met by using a mobility device and they do not have any other disability that might hinder them waiting, they are NOT eligible for a DAS pass as the ride lines are handicapped accessible. So if grandma just had knee surgery or Johnny just broke his arm in a baseball game, the DAS pass is not for you. Get a pass as soon as you enter the park for the ride with the longest wait. You can then fill the time with rides with shorter waits or use your regular FastPass+ during that time. Get another one for a ride with a long wait time right before you break for lunch so meal time will fill up the wait. Remember that there will be at least a short wait even in the FastPass+ line. Be prepared with snacks, or diversions like an iPad. Waits are typically 5-10 minutes but can be up to 20 minutes. Send someone from your party who is on the DAS pass to the ride to get the return time and have someone else remain with the child with the disability. Going up to the ride with the person with a disability to get the return pass and then having to walk away to wait can be really tough, particularly for a child with autism. The DAS system isn't without its critics, but many find that it works well for them. Have additional thoughts or comments? Feel free to share in the comments. I have MS and have difficulty standing still for any period of time, this is something I have always had difficulty with. my nurse has agreed to put a recommendation forward, do I qualify for a pass and if so how do I apply and what would my nurse need to supply as evidence? I am very anxious that my disability could have an impact on my childrens experience and dont want to ruin it for them. I am a single mother. I torn my tendon in my foot last week. We are going to Disney this week. I am in a walking boot, but my doctor says I shouldn’t be walking for long periods of time. I’m going to have to rent a scooter. Would I get a DAS pass? I can’t stand for long periods of time on my foot. And I don’t recall being able to bring a big scooter through the lines. Likely not. You can be accommodated with mobility help. DAS is not for that. My husband and I will be visiting Disneywold in January 19. He is extremely claustrophobic. I know some of the rides you have to wait inside small areas with lots of people and it is cramped. Is there any way to avoid those close tight waiting areas? My husband is 100 percent disabled vet he has a neuroplant stimulator implanted into his back. He can’t stand for long periods of time. Would he beable to utilize the DAC even though his disability isn’t visibly noticeable? I have a spinal cord stimulator and an Intrathecal Pump because I have Reflex Sympathetic Dystrophy. The biggest concern with standing in line with those is the potential to get hit or kicked or knocked over while standing in such proximity to others, especially children- if that happens it has the potential to paralyze the person. Because of that, reducing the amount of time spent in line is best. Once I explain that to the CM, the are pretty understanding! I don’t know what his other disabilities are, but you want to focus on why he can’t stand in line. And while Disney cannot ask for documentation, you can offer it to them to help them better understand your situation. I have ADD, migraine, Narcolepsy, Fibromyalgia and anxiety disorders. Waiting in line for long periods causes me so much stress (and a little uncomfortable for my body) but my family loves Disney so we’re going! If my anxiety peaks, I’ll fall asleep in line which is pretty dangerous. You would never guess that if you saw me- it’s hard to describe to people that I’m actually sick. How should I go about discussing my need? I used to get the pass at Disneyland but I read rules have changed? Thanks for your time. You’ll want to explain why you aren’t able to stand in line. I have a similar condition to fibro (Reflex Sympathetic Dystrophy) and standing in lines is difficult for me because of the risk of getting hit which could land me in the hospital. Plus I have other conditions related to the RSD that require I be close to a bathroom. I just explain why I can’t stsnd in the line. While Disney cannot require any documentation, it doesn’t hurt to have it to help explain your situation! I have ptsd, since my fiance committed suicide and I came home and found he hung himself. I have difficulty being crowded in with people. Can I get re DAS pass? Sorry you had to go through something so difficult. All you can do is let the Cast Member know your situation and they will let you know how they’re able to help. If I have a party of 8 going( my family of 6 and two grandparents to help ) will DAS not work? We have a child with autism and are bringing my parents as extra help? There is a group on fb “tips for special needs at Disney” you may want to join. According to many people on there, the policy is 6 People, but Disney will usually accommodate larger groups and add everyone onto the DAS pass as they know families like to stay together during a trip. You just have to be prepared that they could say no. We are considering traveling to Disney World with my three nephews, their dad (my brother) and my parents. All three boys have Autism. Would we be able to get a separate DAS Pass for each? It’s likely they will not want to do the same thing most of the time. You can have different passes. I have two kids with different disabilities, who are 8 years apart in age. We always get two passes, because often my hubs and I have to divide and conquer with their different interests! Last visit Jan 2017, and this was no problem. Does a Cast Member at Guest Relations determine who receives and who doesn’t receive a DAS pass? This really concerns me because my daughter is disabled, has to be cathed every 2 hrs, and has type 2 diab. Are Cast Members trained to understand disabilities. Disney should be asking for medical proof, it’s legal because Guest are requesting special services and telling their medical information. We are planning our first trip in May 2019 and this is a big worry for me. What if we are denied a DAS pass? What then? Any advise? It’s not considered special services as DAS provides equal access, no more than that. Therefore, they can’t require proof. Since they can’t require it, some people won’t have it and they can’t give more consideration to anyone who brings it. That would be essentially requiring it. My daughter is a Type I Diabetic. We didn’t bring any proof (she does wear an insulin pump, but they didn’t even ask), and we had no problem. I just said she was a Type I, and long, hot lines are a problem. They were very accommodating. They don’t ask for proof, and I’ve never heard of anyone denied. In addition, our son is Autistic, which is “invisible”. They were wonderful, and we have never been denied a pass. I would take this off your worry list! Last visit January 2017, 12 visits total. We will have 7 together with 4 adults and 3 children needing to use the DAS. Will they make the exception to allow all of us to use the DAS or is it a hard 6? While the rule is 6, Disney is known to make accommodations for slightly larger parties since they know families like to stay together. Just ask at Guest Services! Can two people in the same party both get DAS? or is it limited to one per party? It is not limited to your party. If two people need the DAS Pass, then 2 people get the DAS Pass- regardless of if they are in the same party or not. My son gets one because he has Autism; I get one because I have a severe chronic pain disease with other issues requiring it. Each person in a party that is eligible is able to get a DAS, but no one can have more than one DAS return time in the system. If both pass holders want to go on 2 different rides, the other members of the party need to decide which pass holder they are going with and the CM will give enter a return time in the system for each person accordingly. If you request another return before using the first one , the system will cancel the return time for the first ride and replace it with the 2nd request. We just returned from Disneyworld FL. I had a 9yr old daughter and 5yr old son who has sensory & behavioral issues & is on the autism spectrum. The DAS was a lifesaver. We were able to use fastpass that we set up ahead of time and schedule a return time for 1 ride at a time using DAS. This allowed us to take frequent breaks for using the bathroom & just finding a quiet spot to calm down before hitting the next MK attraction. We still waited our turn (and rightfully so!) but were able to do so outside of a confined, crowded space that could have sent my son in a downward spiral of overload quickly. I found all staff members very friendly & helpful, even slowing the moving sidewalk so we could get on more easily & explaining exactly what was happening- all very appreciated. I also was allowed to use my son’s stroller as a wheelchair & bring it to the front of most rides (after waiting our turn) which was most helpful in keeping his energy at a manageable level & not forcing me to carry him. I have a severe bladder disease where I can urinate around 50-60 times a day. Would I qualify for a bathroom pass to use the restroom asap ahead of people? I will spasm myself to peeing myself with horrible pain causes me to double over and vomitZ 🙁 I’m going to be post op total hysterectomy and cyctocele repair during this trip with my toddler. There’s no accommodation for restroom lines, no. What about kids with type 1 diabetes, insulin dependent, still using shots? the long wait time may affect BG levels. As a T1 of 29years I would not use a DAS pass for this. You can carry both insulin(if not on the pump) and snacks to treat lows while waiting in line. I have a sprained ankle and will be in a walking boot for the entirety of our disney trip next week, will they permit a DAS pass for me and my family, or will they simply tell me to rent a wheel chair? My 7 year old daughter has severe nerve damage in her left leg and the leg as a result is atrophied and significantly shorter than the other leg. We have always dealt without any accommodations at parks, but during our last visit to Hershey, she was in a lot of pain and wanted me to carry her. She is not a child who would tolerate being wheeled in a stroller (even as an infant she squirmed and screamed when in her stroller) though I have considered trying to convince her to accept it. I am considering DAS as a potential option for her though not sure if it is truly going to be necessary or will help much since we will still have to manage with a lot of walking. Does DAS include accommodations of seating for disabled kids when waiting for rides? It does peeve me to see that people get it for sciatica and obesity only. My daughter has no femoral nerve function and lives regularly with muscle spasms and cramps in her functioning leg and the idea of someone getting accommodated for fully preventable or very common ailments is upsetting. I recently went to Disney with my family. My husband and daughter a connective tissue disorder that makes standing for any length of time painful (imagine standing tip-toe for 10-20 minutes while waiting in line…. even with the DAS pass). I recently called Disability Services to discuss our concerns and offer simple suggestions (such as a bench for those while waiting)…. I was told that benches were removed for safety reasons (children climbing on the benches… getting into flower beds). 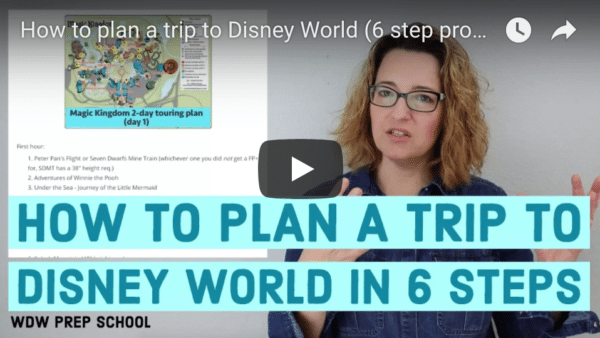 I was frequently told how Disney consults with a team of experts… not sure how that helps my family when the team of experts can’t come up with a solution that would make it comfortable for people who have a difficult time standing (no place to sit while waiting for an attraction, the bus… and often no opportunity to sit while on the bus). The DAS does help… but be prepared for a lot of standing with extremely limited opportunities to sit. A wheelchair or stroller as wheelchair would be the appropriate accommodation. Anything mobility or stamina related does not qualify for DAS as the lines are accessible. It doesn’t eliminate waiting. NO ONE gets this pass for Obesity. And Sciatica? How dare you! I have seen my best friend in the ER screaming with Pain. You have no idea what you are talking about! And you need to “convince your daughter to sit in a chair”. Please her bad leg has nothing to do with bad behavior accepted by less then adequate parenting. You have some nerve!!!!! Just because someone is obese doesn’t give you the right to judge them. I’m obese. I also have the most painful condition known to man, Reflex Sympathetic Dystrophy also called Complex Regional Pain Syndrome (look up the McGill Pain Index for proof). You can’t tell it by looking at me. But I’ve been through heck and back. I’m obese because of the inability to exercise plus the way the RSD affects my digestive system. Your judgements attitude is part of the reason disability rights have not progressed. Also, I’d be careful with that attitude- I wouldn’t want it to come back and negatively affect your disabled child. The DAS works for my family when timed perfectly (as close to perfect as possible) with fast pass+ times. But I can see how it could be a problem for some families, especially those who aren’t tech savvy or elderly. I also don’t see how this cuts down on abuse. There is nothing stopping the same type of people from getting this pass as well. Hi Hope – I will be going to Disney for the first time this September with 2 grandparents awaiting knee replacement surgeries (they cannot walk well or long or stand for long). Any tips you have for navigating the Fast Pass system and the DAS if they choose to get that? I am seeing your comment about being tech savvy and want to be sure I know what I am doing. We will be traveling with my 4 yr old. Any tips on what times to do fast pass/how to incorporate DAS if that’s an option for us would be great. Thank you. you do not need the pass. You need a couple of scooters or wheelchairs. They do not have a waiting problem they have a mobility problem. We are traveling with a 5yr old hearing impaired little girl that clearly wears hearing aides. What kind of documentation do we need to bring? You don’t have to bring anything. Just go up to Guest Services when you arrive and explain how her hearing loss affects her ability to experience different aspects of the park (having her wearing her hearing aids when you are talking to them really helps). Especially how she will need to be seated near the front of shows, or near speakers on rides with sound, ect. You may have to explain how she cannot use captioning devices yet as well, though at 5 they will hopefully understand this without your having to mention it. Also, if she uses ASL in addition to her aids there are other accomodations available too. I have IBS -D. When I went to WDW in August I did get a DAS pass. Of the 7 days that me and my family were there, we actually only used it on our last day there. My daughter doesn’t do well with loud noises or darkness would this help us for her to still appreciate the experience. As a former Cast member (15 years ago) and current parent of 2 children under 5 (one little guy that has mosaic Down syndrome), I believe the DAS pass has changed for good reason. There are non fast pass rides that would be WONDERFUL to have available though! Find good cast members to help you. If your family member is struggling in line and you don’t have a DAS pass, because you are honest and don’t really qualify. Ask for a magical moment on a ride or 2 that is really important to you. If you find a cast member with pixie dust, they will make it work. My son completely qualifies, but won’t enjoy many rides and my dad, 68, is coming with us with 2 knee replacements, bad back, prostate issues, and a grouchy attitude. It would not be fair to use the DAS for my father when he can lean on wall, use the restroom before, and only has a few rides he’ll enjoy (he’s there for the food and watching my kids light up- he was at Disneyland on opening day). He gets it, but we asked 5 years ago on his favorite ride and they sent him through fast pass (they were all gone). Be friendly, not demanding, gracious, and cheerful and magic might happen for you. I’ll let you know how my little family of 4 handles their first trip in November with the DAS. We are going to WDW in November with my husband, 6 YO, and my retired parents. I think this is the last of this kind of trip my parents will every do. My mother has had 2 knee surgeries & her mobility is impacted if walking a great deal. She has received a letter from her doctor. My question is, who can tell me with experience if they think Disney will accommodate her? They dont issue the DAC for issues walking/standing. They will just tell you to rent a wheelchair. Cheryl I have the knee problems and severe spinal issues. I can not walk or stand for more then maybe 10 minutes. I go to WDW every year. I rent a scooter and have a great time. You do not need a pass. I think a lot of folks have this pass confused. It is not for mobility issues. Does anyone know if there is a place to store a cane while riding rollercoasters? Interesting, i have an 8 year old that we always struggled in lines so much when we went when our twins were 4 & 6, in Feb we found out one of them has Tourettes syndrome, ADHD, Anxiety, SPD, and i think we will also eventually be diagnosed with OCD and a comprehension disorder, and who knows if there is more, she functions normally but is on Catapres which helps, despite planning and being there at rope drop and carefully picking fastpasses we skipped alot of stuff because long waits are just too hard with her, being from Australia you really dont want to skip stuff, not sure if they would give her this Das, but i would find that so much easier with her, esp as she doesnt comprehend time and waiting periods either, she is a sweet kid,funny and crazy, but she can be so hard and will pull her muscles when she is stressed, but at least since Feb we understand our daughter. I am an adult going to WDW in April 2016 with my family and grandchildren. I was wondering if I would have any problem with getting a DAS pass for myself. I have Chronic Bronchitis that never seems to go away for the past two years and daily using inhalers to breathe and sometimes I have a very hard time catching my breath also I have Scoliosis and standing for any long period of time puts my back and legs into fits. My diabetes keeps me so tired and week along with a bad liver and recently recovering from Colon Cancer. I know I will have to return to my room to rest quiet a bit but would I qualify for DAS ??? I have a child that has DS & Autism. She hates to be touched by strangers and to be measured all the time. I heard you can go to guest services and get your child measured there just once so you do not have to have them measured at each ride. Is this true? My wife has MS and a moderate amount of walking and/or standing will impact her. We are planning on getting a scooter so that she doesn’t have to walk long in the parks. Looking at her, you wouldn’t guess that she has an issue, but she does – especially in warm weather. While the scooter is our choice and we will do it, I am considering asking for a DAS pass and would like to think that we would get it. I agree that some form of documentation should be requested if the disability isn’t immediately noticeable. My dad is 90% disabled army veteran. He has major issues with crowds (PTSD) and standing too long. Does he qualify for DAS? What part of it is illegal to require proof of disability for Providing EQUAL Access under the ADA do you not seem to understand?? This service is providing equal access, therefore they CANNOT require proof of disability. Please do your research. your method of education is neither considerate nor necessary. a point can be made simply by stating the facts. As a morbidly obese person, you’ve got to be kidding me. I had the disability BEFORE the weight. The disability caused the weight. I also have a child with autism and would never suggest one disability needs an accommodation more than another disability. I am a Dvc memeber and have a child with autism. I am not content with the DAS system. People with disabilities are being punish for other people’s abuse of the system. Even this system is not great at all. Example: I go ask for a time we could come back to test track (come back in 40 mins) and meanwhile I go to another ride say mission space and the wait is also 40 mins . It doesn’take sense. The system is not designed so that one can ride more rides in a day it is designed to enable you to wait in a more comfortable location (depending on your disability) until your ride time. Disability or not everyone has the same wait. That’s awesome! I’m so glad it went well. All my families had a wonderful experience and said the DAS pass made their trip so much better. One family really wanted to encourage families with autism to go to Disney because the pass really helped them have a good trip. Can we get a DAS for a chronic achilles heel issue? I doubt that you would qualify for DAS, what your describing, a chronic Achilles heel, could be resolved with a wheelchair or ECV, this is a mobility issue, not cognitive. It’s not that you “deserve” anything over someone else. It’s that Disney has lines that are wheelchair accessible which would accommodate your issue. First of all, THANK you to the guest writer and to WDW Prep for finally putting some information for the disabled on the blog. I LOVE THIS blog, and was going to ask to write (or someone to write) something about touring with a disability!!! My Husband is a C5 Quadriplegic and uses a power wheelchair, and we have been twice since his accident, and once more just to the MK via a Disney Cruise. So, I’ve read about this and am confused a little bit. We are going to WDW in December, and since he cannot get out of his chair, he will not be riding most rides. But the Character greetings (our party of 10 has 3 young kids) is something we would want to use this on. Good to know the 6 person limit though, rules are rules, we will follow. So, my real question and what’s confusing to me is I’ve read if you have an obvious disability like using a power wheelchair, you don’t really need a DAP. If we want to use it for the Characters (with Fastpass) only, should we get one? FYI, In the past, we would get in character lines like everybody else (last time in 2007) and a cast member would grab us out of line and take us to the front. We never assumed we would be brought to the front, but we always were. I’m sad that they had to change this policy, but I’m glad they are trying to stop the misuse. I would go ahead and get the DAS pass! I used the example in the post more to illustrate that it wasn’t meant to give everyone on a scooter or a broken leg a pass. I think it’s completely reasonable to ask for one if you have a spinal cord injury. I know my husband’s best friend who has a spinal cord injury gets tired very quickly and a pass would help him enjoy more of the park. Thank you Elizabeth!!! for both writing the article and for the information! We will then be getting the DAS and having me and my son and the other Father and his 2 kids on the pass so we can do the characters! Your article is wrong you do not tell cm what your disability is. You tell them what kind of accomendations you need. I can not walk up and say my 12 year old is autistic. But explain his sensory issues and waiting in crowds for long periods makes him melt down etc. Several changes to the original version of this post have been updated to improve accuracy and clarify some of the details. Appreciate your feedback. I wish they would ask for some sort of medical proof to insure honesty. I see abuse still going on while i am waiting in line to get the pass. My son is 25 years old and mentally and physically disabled. We struggle with this new system. Recently a woman ahead of me got a pass because her sciatica was acting up! I was floored! Perfectly capable woman! I mean really, everyone’s sciatica acts up in disney! The part of having the whole group together is a little bit of an issue also. I bring a caretaker so i can swap out and get a break. We are never together from the moment we get there. It would be great if she could go alone and get added but she has to have my son with her and that means waiting in a long line again to get this done. Happy they are working on it tho. The new rule of being able to send someone ahead is awesome. However, it’s just me and him so this doesnt really help us. And he gets super frustrated when i walk up to his favorite ride and have to walk away. Hits and bites himself. Not a pretty picture. Again, glad they are making changes that help most! It’s a tough life raising disabled children. I am so frustrated with this new DAS. I am a mom of a cerebral palsy and epilepsy child among many other health conditions. We loved to go to Disney parks in the past because of their respect and excellent services for the disabled. But now, since they started with this new system it turned out to be hell for people like my daughter. Many times the irrational waiting and simple not being able to get into attractions is so frustrating that we certainly lost the love for Disney Parks. Also, the crew members act so disrespectful and senseless toward people like our children. That has being my experience two years in a row already in most Parks and several lines. When will Disney Parks come to the sense again? Thank you for mentioning epilepsy as a disability. My 7 yr has epilepsy as well as complex migraines (symptoms are similar to a stroke.) however to look at her you would never assume she has needs that need to bee addressed. I called Disney disability services a few months ago to ask for a list of rides and attractions that represent problems for sensory issues. There was no list to speak of yet the woman I spoke to took the time to discuss her thoughts on things to avoid. I highly recommend speaking personally to a staff member on the phone. She told me about the program and explained that she thought it would help. Especially as I said a huge trigger for my daughter is stress and heat. The excitement of starting kindergarten last year forced her into the hospital for a week. I am a bit nervous about the comments of other guests. I see a lot on the page about abuses people witness and as I want my daughter to have an amazing first trip to Disney without judgment. I am hopeful this goes along stress free… But we shall see. I am grateful for this post. Thank you for all the comments to read. It’s been enlightening. I found it a challenge. When you say you have a party of 7, 2 with ASD they split your party. This was so wrong and a huge issue. It states each guest can 6 with them. There were many times the children were seperated. One person would be with one child and all the rest together but because they put 3 and 3 it was a huge issue and challenge. another issue is for children with OCD ASD they like only a couple rides over and over again. The Fast pass and DAP does not allow this to work. My one child can ride that all day. So just because there is more than 1 identified child doesn’t mean the group should be split. We will no longer be going until they are much older. It really needs to be improved!!! Were you able to ask them to design something different for your family? I’m hoping they could accommodate your family’s needs. That wanting to ride over and over is a tough one! Our family of five, including my 16 year old daughter with cerebral palsy who is wheelchair bound, made our first trip to Disney in May of this year. I had read many bad things about the system and was very apprehensive as to what to expect. I am happy to say that it went very smoothly and every cast member we encountered was very nice and made our trip very special. I can’t wait to take her back in a few years. She loved it! This is good to hear! I have a CP daughter who is three. Our last trip to disney she was just under two years old. It was no issue at that age to hold her in lines after we parked our stroller. Now we are bigger and are harder to hold 🙂 She has a wheelchair but I am going to use a good stroller that will be more comfortable for her all day. I know that I am going to get the sticker I have heard about where you can use the “stroller as a wheelchair” so we can keep in with us in lines. But here is my problem. She will not stay in her stroller if we are sitting still. She has severe tone and is will not sit still for long periods. Keeping her moving will be the best way to keep her (and everybody else nearby) happy. Do you think this will qualify for DAS? I do not want to take advantage of anything. I just know she will do better if I can get her out and hold her eating a snack sitting down. If I have to hold her in every line we stand in I will not be able to move past day #1.